How do you fit an entire new neighborhood for 65,000 people, complete with offices, schools and streets, into the already congested and overdeveloped island of Manhattan without knocking anything down? Hover it. 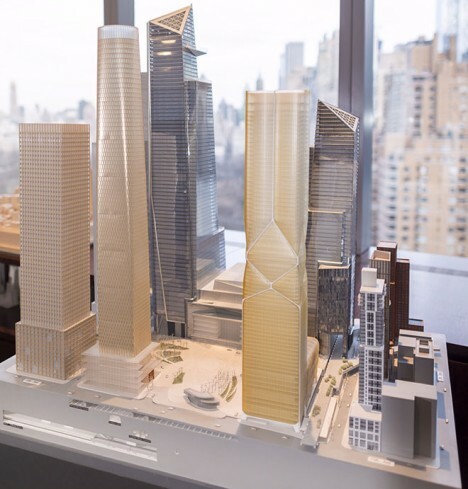 That’s the plan for Hudson Yards, the largest private development project in U.S. history, which will be erected on a super-strong platform over an existing active rail yard between Chelsea and Hell’s Kitchen. The whole massive, incredibly heavy thing will barely touch the ground, resting on 300 concrete-sleeved steel caissons inserted 40-80 feet into the bedrock. Borrowed from bridge-building techniques, these supports will hold up a slab that will serve as the foundation of six skyscrapers, 100 shops, 20 restaurants, a school and 14 acres of parks. 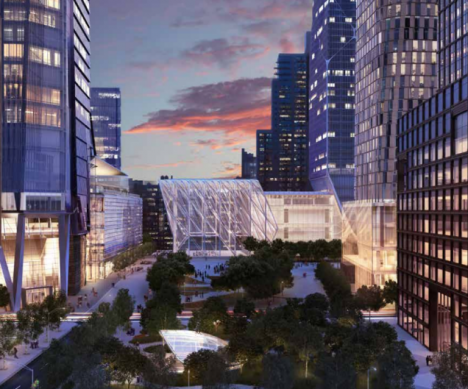 The 26-acre West Side Yard over which this development will be built is a critical part of New York City’s transit system, serving overflow Long Island Railroad trains during rush hour with 30 tracks and space for storage and maintenance. Luckily, its original developers in the 1980s realized that one day the space would be prime for redevelopment, and left a gap around the edges of the yard just big enough for structural members to be installed without interrupting traffic. 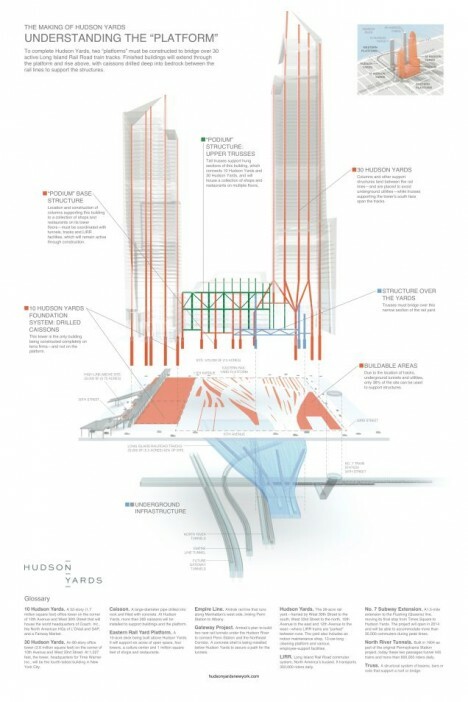 Since the trains will still be active while Hudson Yards is under construction, actually getting everything into the ground will be a bit of a challenge. The builders plan to sink the caissons in sections and then attach them to 100-foot trusses whenever there’s a window of opportunity in between moving trains. Gizmodo got an early look at the plans and has a series of mesmerizing gif images of exactly how everything will come together. It’s an interesting example of developers finding space for something new in a bustling metropolis without disturbing existing functionality, and even arguably improving a lot that many find an eyesore. 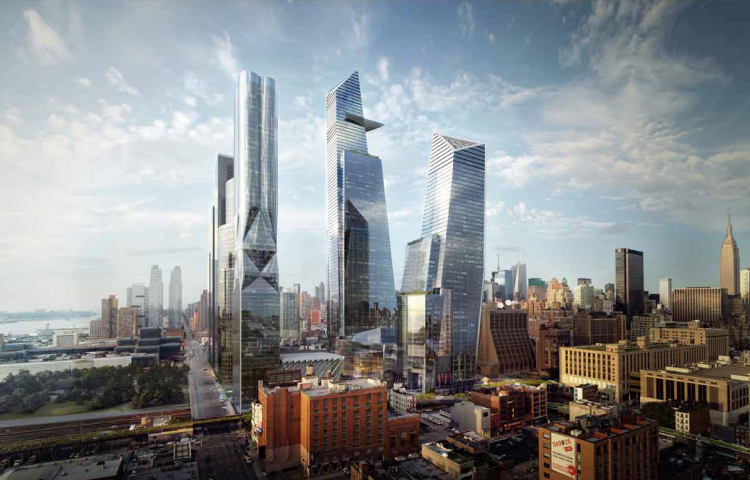 The final phase of the city’s High Line park, set to open later in 2014, will connect directly to Hudson Yards, which should be complete by 2024.